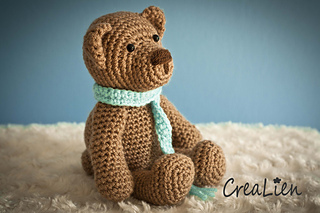 This is the PDF crochet pattern from Bear Bob. 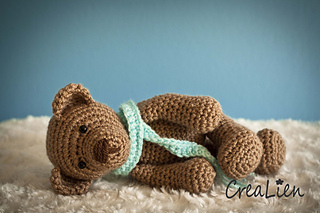 I designed him myself and crocheted him with 100% acryl yarn (DK / 8 ply) and a 3.5 mm hook (E) and he is stuffed with fiberfil (pillow stuffing). 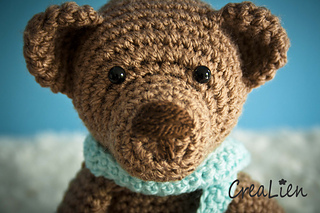 I made him in the color Mocha, his nose in Walnut and the scarf in Sherbet. Of course you can choose for whatever colors you like. 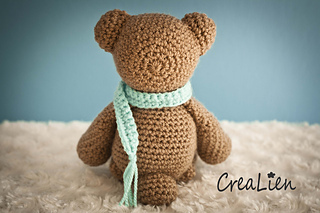 You can also choose another yarn type if you would like, just make sure you use the right hook size (preferably a bit smaller than the ball band says). Bob is approximately 14 cm / 5.5 inches when sitting and from crown till toe 20 cm / 8 inches. 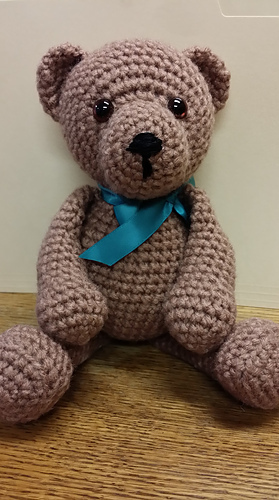 I only used single crochet stiches and made it by the amigurumi technic. 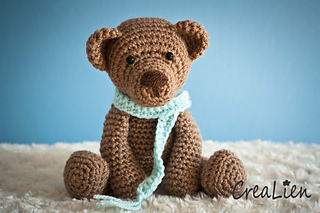 So if you know how to decrease and increase with single crochet stitches, you should be able to make Bob by my pattern. The pattern is in English with U.S. terminology. Off course there are also pictures included to make some things more clear!